Spring has come early to Northern New Jersey. That is a cause for concern. More about that later. The early arrival of spring is also a cause for rejoicing. The furnace runs less, and we have more reasons and opportunities to step outside for what passes for fresh air in Northern New Jersey. The growing season may also be a bit longer. 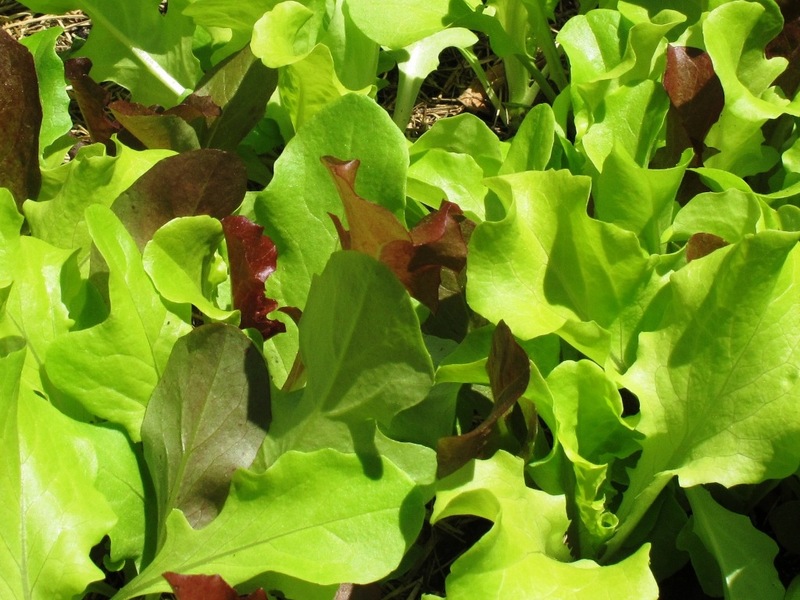 Although it is a bit of a risk, seeds for cool-weather crops such as spinach, lettuce, and peas can go into ground that later can be planted with tomatoes or summer squash. This weekend’s snowstorm is the talk of social media, local and national news outlets, and probably some international news outlets as well. The local newspaper does not have a snowfall total for Clifton, but nearby towns report amounts in the high teens and low twenties. It seems safe to say that we received at least twenty inches. Hopes and expectations have been high for substantial action to come out of Paris climate talks (officially the 21st Session of the Conference of Parties to the United Nations Framework Convention on Climate Change or COP21). The Earth as seen from Apollo 17 on 7th December 1972. NASA photo. With six days of the conference completed, and six more days to go, it is too early for anyone to pass judgment on the proceedings. I’m not qualified to do that in any event. We might reasonably expect one outcome, however. That is that the actual good accomplished by the decisions and actions taken at this conference will not live up to the hopes and expectations of the participants and observers. There are too many hurdles for the participating governments to overcome to implement the practices that are needed to reduce the amount of carbon that people put into the atmosphere. That’s not to say that governments should make the changes that they can make or that we should not support our government in its efforts to reduce U.S. carbon emissions. It is, however, the nature of international relations that each government must look out for the interest of its citizens and must respond to business and other entities that seek to direct the course that government takes. The political priorities of all of the nations of the world will not be set aside to create the unified approach to climate change that the planet needs. It would be pleasant to think that the Breakthrough Energy Coalition will be successful in developing and deploying technologies that can reduce greenhouse gasses, and I certainly wish these people well, but these are business people who have amassed through aggressive business practices the enormous fortunes that they are now pledging to the cause. Also, as with international relations and politics, is it reasonable to expect profit-oriented businesses to favor reducing greenhouse gas emissions over all other considerations? Will we as shareholders—my retirement funds are largely in equities—tolerate that? All of this may of course be lazy, ignorant bloviating. What I should be saying is that creation care, including reducing global carbon output, still comes down to the informed and voluntary efforts of individual citizens. It requires that we approach all aspects of our life holistically, with a sense of stewardship instead of entitlement, which living in the United States tends to produce. The already existing outcomes of climate change, including rising sea levels, more frequent and more severe droughts, and more frequent severe storms, also require that we look with compassion toward those who are most directly affected by those outcomes. The season of Advent reminds us that a day is coming when the creation will be restored and the sins that are pollution and environmental degradation will be removed forever (Isaiah 11:1-9, Romans 8:18-26). Until then, we can always find ways, some small and insignificant, some more substantial, to reduce our carbon footprint and other impacts on creation. One that has caught my attention again recently is reducing the consumption of red meat, particularly mass-produced beef. You may choose other efforts that are more closely aligned with your creation-care priorities. May God bless and encourage you as you pursue them. If you’ve read this far, thank you for your patience, and thank you for stopping by. Best wishes for a peaceful Advent and Christmas season and for a healthy and contented New Year. The lettuce needed to be thinned, and some of it was mature enough to be put in a salad, so we enjoyed with our evening meal the first produce from the garden at our new home. This event brought to mind a recent article circulated on Twitter by @Food_Tank (http://www.greenbiz.com/article/urban-farms-now-produce-15-worlds-food). As the headline indicates, as much as one-fifth of the world’s food is now produced by urban farms. One needs to look to places such as sub-Saharan Africa to find cities with truly substantial urban food production. In such places up to 40 percent of the urban population is engaged in food production. That percentage is much smaller in the United States but it appears to be growing. The first lettuce of the season. Coincidentally—although I don’t believe in coincidences—our church’s adult Sunday School class has been discussing food insecurity after viewing the documentary film A Place at the Table. (https://www.facebook.com/aPlaceAtTheTableMovie). Here’s where the question “who will be privileged to eat it?” becomes salient. The readers of this blog know that I believe small farms and gardens can be a part of the sustainable world that we need to imagine and build for our children and grandchildren. How does the produce from these plots get to the people who need it most, the people who live in the places that have become known as food deserts? Organizations such as City Green, an urban farm organization run as a nonprofit enterprise, have a mission to provide affordable organic produce to urban areas in and around lower Passaic County, New Jersey. In northeastern Essex County another nonprofit, A Lot to Grow, maintains several community gardens. The vegetables that they raise go to homeless shelters, food pantries, and facilities that provide assistance specifically to seniors. There are several well-stocked for-profit produce stands and farmers markets selling local produce in season in the area, and we patronize them when we can. There are, however, many times when we have to check our enthusiasm and limit our purchases because locally grown fresh produce can be expensive. We’re not wealthy; we’re still members of a shrinking middle class. If we can’t always afford local produce in season, how can the people who have to string together a series of low-wage jobs possibly afford fresh produce for their families? We (now a broader “we” than just my spouse and I) might be tempted to think that the U.S. federal government can and should solve the issue of food insecurity and eliminate the food deserts in America’s urban areas. But the federal government won’t. Not even if Bernie Sanders or Elizabeth Warren is elected President in 2016. That’s not intended to be a rant but an observation. There are undoubtedly many elected and appointed officials who would use the power of their office to bring about the necessary changes if they could. However, If Barack and Michelle Obama, who planted a vegetable garden on the White House grounds, could not advance the cause of food security for urban residents, it’s unlikely that any elected official can do so in the near future. The best hope for mitigating food insecurity is still the private sector and nonprofit organizations. Dear reader, thank you for your patience with this post. My hope and prayer is that just one of you will find a local community garden or urban farming organization to which you can donate some of your time or treasure. Tending a garden, whether it’s my garden or an organization’s garden, is one of the most satisfying forms of work I can think of. The work is physically demanding, to be sure, but the aches and blisters are temporary. Bending over and pulling weeds from the rows of vegetables, or cutting those weeds down with a scuffle hoe, I smile when I think of the people who might enjoy those vegetables in a few weeks. In our country, with the abundance of resources that we can all enjoy sustainably, there is little reason why every resident should not have access to affordable fresh vegetables and fruits in season from local sources. On the first morning after the latest snowfall the snow begins to retreat even though the air temperature is still in the teens. 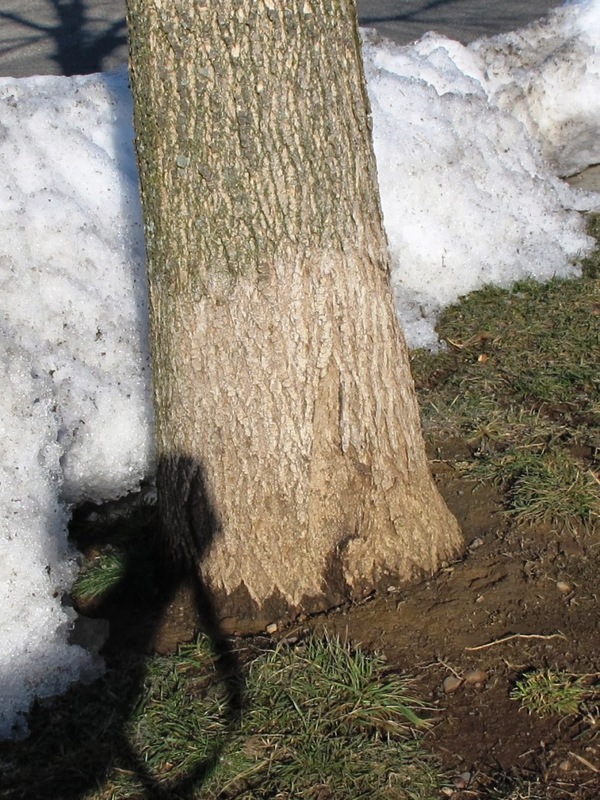 The trunk of the maple tree, buried in over two feet of snow after we had finished clearing the walks, is exposed on one side by the second afternoon. By the third, the trunk is completely exposed. This tree trunk was buried in snow only a few days ago. The sun, now approaching the equator from the south, delivers more of its energy to the Earth’s surface than it did just a few weeks ago. For those who have patiently awaited a break in the pattern of snowfall and deep cold, patience has been rewarded. To those impatiently cursing the snow and cold, relief has also come. Spring is finally here. Except that it isn’t. The weeks of cold temperatures that preceded the most recent cycle of storms and cold left the ground beneath the snow standing “hard as iron.” Although the ground will be exposed to the sun, it will be several more weeks before the thaw reaches this year’s frost line. Meanwhile, and especially if it rains, the season of mud is now underway. The world will be a messy place for some time. Like winter, illness, injury, financial hardship, and other personal misfortunes are hard to bear and strain patience and faith. When relief comes it can take a while before it is fully realized, just as the beauty of spring takes time to unfold. I am looking forward to a visit the local garden center to pick out some perennials. I want to start preparing the soil for a vegetable garden. But if I were to go out now, clear away the snow, and try to push a spade into the soil, I will not get very far. I will end up tracking slush and mud inside and accomplishing little of value. Best to let the sun do its full work and pick up the spade when the soil is ready. That day will come in due time. Overnight temperatures in the low to mid-twenties meant that most of the remaining flowers in the garden were done for. The snapdragons and marigolds had faded some weeks ago, but until the temperatures dropped below freezing the vincas had remained robust with firm shiny leaves and bright white flowers. After the freeze the flowers dropped off and the now-dull leaves drooped as if they had been steamed. The dry, brown leaves of the hydrangeas rattled with the breeze. Even the mums, heavy with spent blooms, bowed to the ground. It was time to clean out the flower garden for the winter. As the branches of the butterfly bush fell to the shears, a bit of color appeared in the debris at its base. It could have been a candy wrapper or other bit of human detritus. It was instead a large fragment of a butterfly wing. 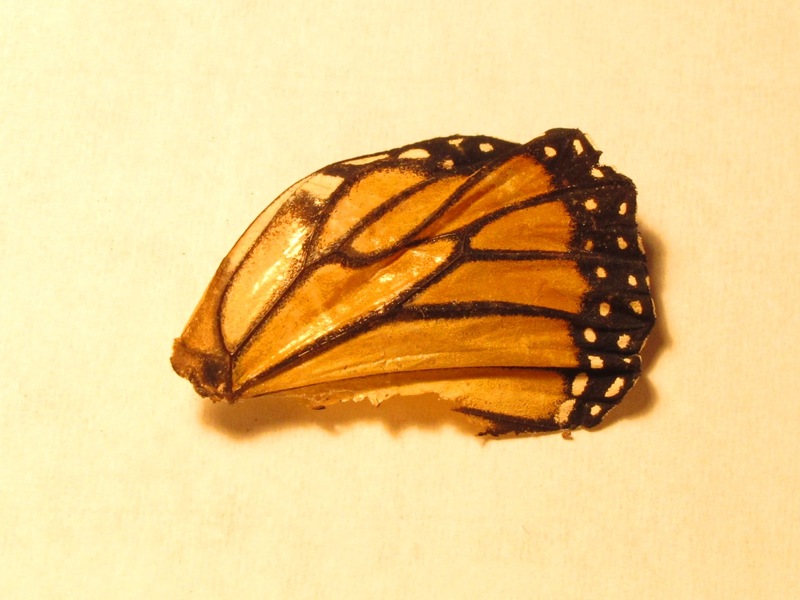 Probably from a Monarch, although it came from the part of the wing that is similar to that of the Viceroy. It was a moment of wonder mixed with melancholy. A fragment of a butterfly wing. Monarch butterflies have an amazing life story, as some readers might already know (see www.monarch-butterfly.com or www.monarchbutterflyusa.com). Their annual migration to and from Mexico and Southern California is well reported, as is the danger they face from pesticide use and habitat loss. A new bit of information for me this year is that four generations of Monarchs are born in their breeding locations each spring, summer, and fall. One generation overwinters in the warm climate, finds mates and migrates north in February and March. The females lay their eggs on milkweed plants and soon both males and females in that generation die. The eggs of this first generation hatch, move through caterpillar and chrysalis phases, then mate as adults and lay eggs. Having laid their eggs, the adults then die. 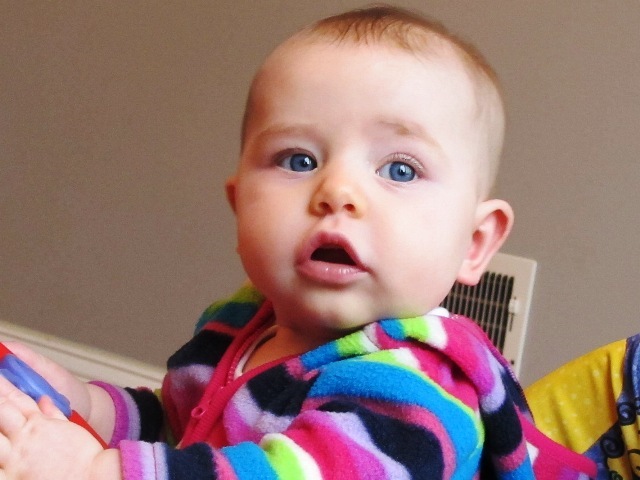 From egg to adult, this generation and the next two generations live only six to eight weeks. The fourth generation goes through the same egg, caterpillar, and chrysalis phases as the preceding three, but instead of laying eggs and dying, this generation of adult butterflies migrates south, where they will hibernate for the winter to begin the cycle again in the new year. While this story could form the basis for an essay on God’s design for creation, the thought that prompted reflection is the ephemeral nature of encounters with creatures such as butterflies. They do not hang around. The longest they stay in one place is the time they spend as a caterpillar or chrysalis, which are interesting in their own right but not as memorable as the adult. Adults visit flowers for a few seconds or a few minutes and then move on. I am thankful to God for the tangible blessings of family, friends, shelter, sustenance, and security, and I am also thankful for the moments in the past year when I have had a slice of joy or wonder in the natural world. The moment we spotted a grape-size toad or a pileated woodpecker while out on a hike. The moment four killdeer chicks sprinted across the field at City Green. The moment in early spring when a Mourning Cloak butterfly lit nearby and we later learned that they can overwinter in cold climates due to their bodies’ ability to produce a substance like antifreeze. The moment I picked the first blueberries of the season or the last raspberries of the season. These moments are brief and fleeting, like the visit of a butterfly, but the memory of them gives reason for thanks. Thank you for stopping by and reading. I wish you and those close to you a blessed and peaceful Thanksgiving and holiday season. May you be granted your own moments of wonder in the natural world. Thanks to a faithful group of bumblebees, our raspberries are producing prodigiously. The bees visit blossoms throughout the daylight hours and as a result we have a constant harvest of berries. One recent morning I was picking some when a bumblebee flew into the group of berries that I was investigating. I enjoy watching the bees and I am happy for their presence so I made no attempt to flee or to shoo this one away. At one point he was close enough that I could feel on my forearm the breeze produced by the fluttering of his wings. 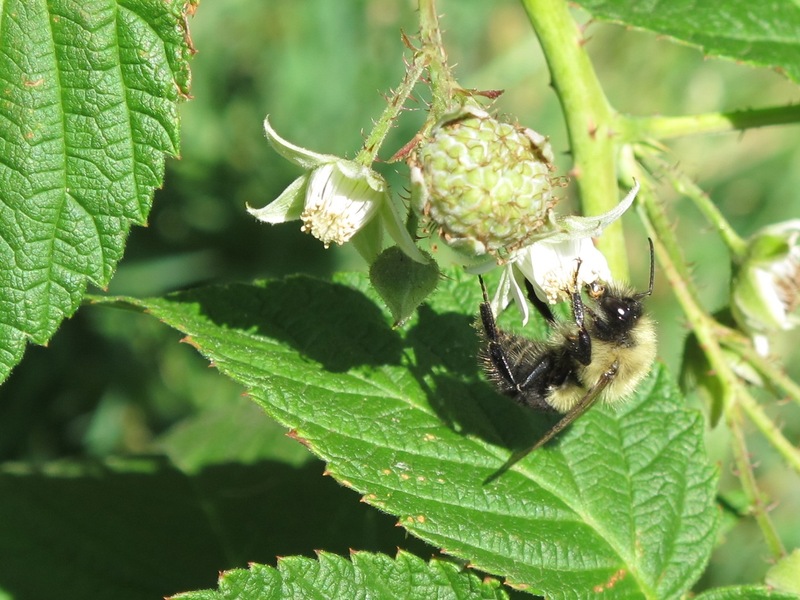 A bumblebee visiting a raspberry blossom, with an immature raspberry nearby. Of course this brought to mind the butterfly effect. The butterfly effect is an expression, if you will, of chaos theory. Chaos theory says that a small change in the initial conditions of a dynamic system will result in that system taking a very different path from the path it would have taken had the small change not been introduced. The butterfly effect expresses the notion that the breeze generated by the fluttering of a butterfly’s wings can affect the strength of and path taken by a hurricane thousands of miles and several weeks away. Could my bumblebee have something to do with Tropical Storm Polo, the latest in the series of tropical storms to threaten Baja California this year? It’s not likely. But it does remind me that small things sometimes make a big difference. The negative effects of even a few poorly chosen or ill-timed words are well known; who among us has not known of a friendship, marriage, or career ruined or derailed by a few words? Conversely, we may also know of a situation where a few words or a small gesture, such as a note of thanks or encouragement, can refresh and restore a person who is going through a challenging time, and thus enable that person to persevere and overcome the challenge. May all of our words and actions be such that they help maintain peace, harmony, and order instead of introducing chaos. Thanks as always for stopping by.